In 1960, 21 year old Siah Armajani left his native Iran to study at Macalester College in St. Paul, where he majored in philosophy but dreamed of being an artist. Today he is a world-renowned sculptor whose work articulates both his lifelong passion for art and ideas, and his experience of living in a culture that is not his own. In this work, Armajani explores exile as a physical, political, and emotional condition. 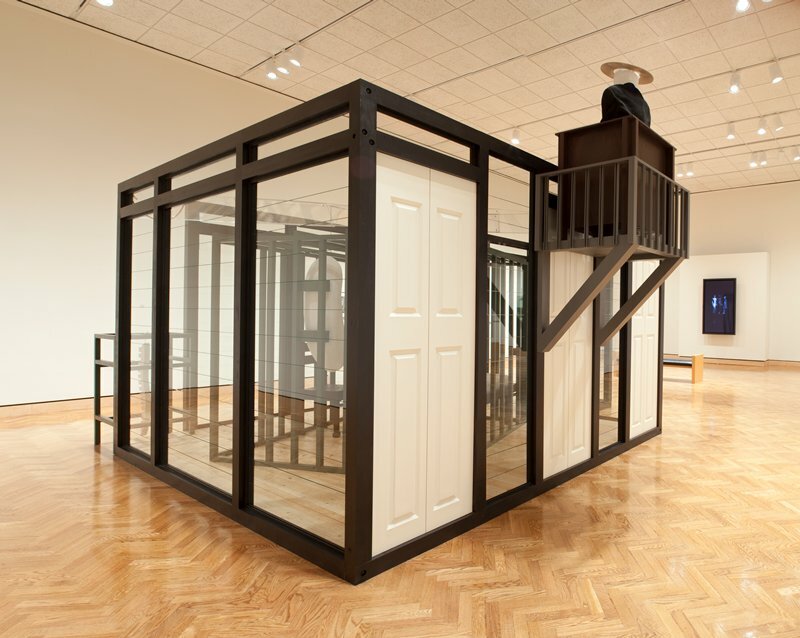 He quotes Alberto Giacometti's surrealist masterpiece, The Palace at 4 a.m. (1932, pictured below), which resembles a miniature stage on which a mysterious play is being enacted. Similarly, Armajani's cagelike structure is inhabited by a faceless figure who sleeps at a desk; outside and above, another watches. The two are frozen in this voyeuristic tableau, forever separated by the sculpture's closed doors and glass walls. Armajani's title references Theodor Adorno, the German philosopher who fled his native country during the Nazi regime. For him, exile was an ethical choice. As he wrote, "It is part of morality not to be at home in one's home."